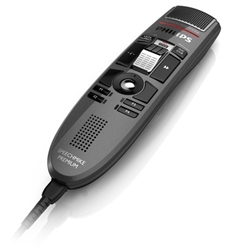 The SpeechMike Premium LFH-3510 takes dictation to a new level. May it be the free-floating studio quality Precision Microphone, a microphone grille with optimized structure, built-in noise-reduction pop filter, antimicrobial surface or the world’s first motion sensor in a digital device – the SpeechMike Premium sets the new standard. The microphone in the SpeechMike Premium is decoupled from its housing for the most incredible crystal clear recording performance ever to be delivered by a desktop dictation device. The completely redesigned microphone suspension guarantees that almost no background noises, touch or click noises, air and structure borne noises are recorded. This technique is derived from studio microphones to make sure there are no sound distortions whatsoever – and guarantee outstanding speech recognition results. A well-engineered microphone grille makes the high-end microphone as in the SpeechMike Premium stand out even more. The hexagonal holes used for the metal grille feature three times more open surface than its predecessor, engineered to provide crystal clear recordings. The microphone area of the SpeechMike Premium is made of many different layers to make it sound as clear and original as possible. One of those is a fleece inserted above and below the microphone capsule. The fleece filters out sound distortions such as pop and hiss noises, guaranteeing perfect results even if dictating closely into the microphone. Equipped with a double sized-speaker area that enables it to play back recordings in clear and crisp quality. Designed with three ergonomic zones, the SpeechMike Premium has been tested and proven by users to have the most comfortable fit in the human hand. The dictation zone is optimized to keep thumb movement to a minimum. The buttons needed for the actual dictation functions are placed in the central area of the device guaranteeing perfect ergonomics and non-fatiguing usage for the user. Less frequently needed function buttons are clearly arranged above and below. All buttons used are formed to give as much tactile feedback as possible. As the back of a dictation microphone is as important as the front, Philips put an emphasis on shaping it in a way so that it perfectly fits the hand and reduces unintentional use of buttons. The trigger and the “command” button on the back of the microphone are engineered to be exactly where they need to be. There has never been a desktop dictation device that is as ergonomic as the SpeechMike Premium. The housing of the SpeechMike Premium is made of high-class polymers. It is endued with a polished surface and the material includes a pearl metal additive providing a high quality metallic effect and making it non-sensitive to touch noises and fingerprints. The SpeechMike Premium’s housing and buttons are made of antimicrobial synthetics, guarding it against all kinds of germs. Antimicrobial materials work against a wide range of different microorganisms such as bacteria (e.g., pneumococcal bacilli and multiresistant microorganisms such as MRSA), viruses (e.g., HIV, influenza, etc. ), fungi (e.g., Aspergillus niger), or algae. The antimicrobial effect on the SpeechMike Premium lasts for at least five years.